Ready to get started? Jump to the interest form here. Since 2001, Gender Odyssey has been at the forefront in providing a space for professionals and communities. The Gender Odyssey Conference is one of the few professional events in the country where you can reach hundreds of transgender and gender-diverse youth, their families, care and service providers, advocates, and other professionals. More and more media attention worldwide is focusing on the stories, needs, and concerns of transgender people. The trans and allied community is a viable and thriving entity more and more recognized both for its diversity and its consumer loyalty to businesses that demonstrate support and inclusivity. A Gender Odyssey sponsorship, web or print ad, or insert lets your customers know that you are in the vanguard of human rights and equality for all. Diverse opportunities provide many ways to show your support and access a new market. Whether you are a corporation, business owner, author, doctor, therapist, academician, researcher or non-profit organization, Gender Odyssey offers a wide variety of channels for reaching this audience. Your cash or in-kind support makes it possible for us to produce this life-changing event each year with a very small staff and otherwise limited resources. In exchange, we can help you be seen as community leaders and allies. Please consider some of the many available opportunities—or let us design a custom package that fits your specific needs. Placing an ad in the Gender Odyssey conference program book is a great way to reach a large audience of trans and gender-diverse people, their friends, families, and a wide array of health providers. Attendees carry it with them throughout the conference, peruse it over the weekend, and take it home with them as a keepsake. Hundreds of people will see your ad — people who are specifically looking for resources, services, and organizations that are friendly to their needs. As an alternative or addition to advertising in the program, you may supply brochures, postcards, coupons, pens, magnets, etc. for insertion into our conference bags. Approx quantity = 500. To ensure inclusion in the registration bags, items and payment must be received by Gender Odyssey by July 13, 2019. We also offer advertising on our website in the form of 160x160px logos or ad files and a link to your website. Your logo/ad will appear in the lower carousel on the home page. Website ads are accepted at any time until July 15, 2019. For more information, or if you have other advertising needs or ideas, please don’t hesitate to contact us at sponsorships@genderodyssey.org. Sponsorship packages are an affordable way to show your support and gain a new market. Whether you are a large corporation, small nonprofit, business owner, author, doctor, therapist, academician, or researcher, Gender Odyssey offers a wide variety of opportunities for reaching your target audience. Each package includes conference admission and various levels of visibility. 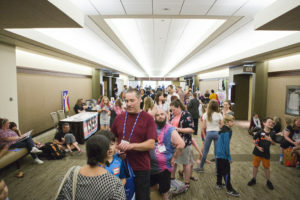 Vendor space in San Diego is very limited. We are currently not accepting applications. A few tables can be reserved with a sponsorship package. Some individual tables may become available this summer. Please check back. If you have questions, please contact us at sponsorships@genderodyssey.org.